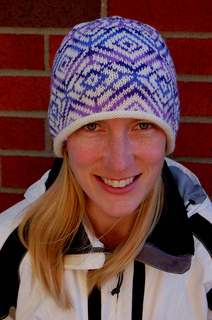 The Joule Hat is knit in the round using the two stranded knitting technique. 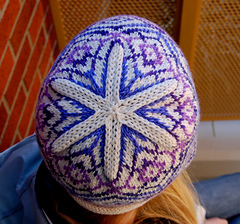 A self-striping yarn allows for gorgeous color changes without many ends to weave in. 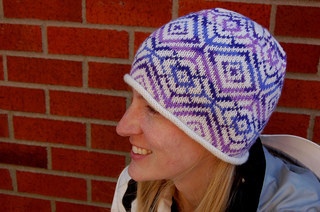 Be sure to check out the matching Joule Mittens! MC: Bare Superwash Merino, Sport Yarn (75% Superwash Merino Wool, 25% Nylon 274 yards/100g): 1 Skein. CC: Felici Self Striping Sport Yarn (75% Superwash Merino Wool, 25% Nylon; 164 yards/50g): 1 Skein. Sizes US 4 (3.5mm) double-pointed needles(dpn) or size needed to achieve gauge. 26 (24) sts. 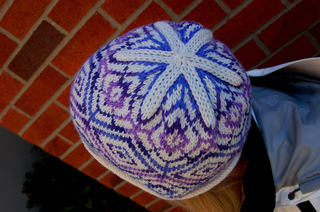 and 26 (24) rows = 4” (10 cm) in color-work pattern.